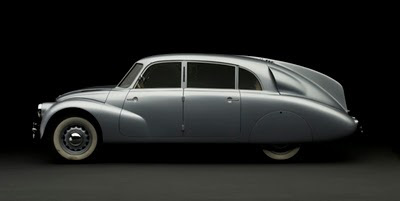 I just realized that the SSS Blog has been suffering from an automobile deficiency of late, so I found the following on the Hemmings blog: a 1940 Tatra T-87. These Czechoslovakian-made cars were on the cutting edge of automotive technology in the 1940's, with features like rear-mounted, air-cooled, aluminum block engines and aerodynamic styling that delivered drag coefficients as low (if not lower) than many of today's sleekest cars. Apparently, Ferdinand Porsche applied many of Tatra's concepts to the very first "volkswagen" in 1938.